The retailer made the announcement the day before we planned to hold events at Macy's in Baltimore and across the country. 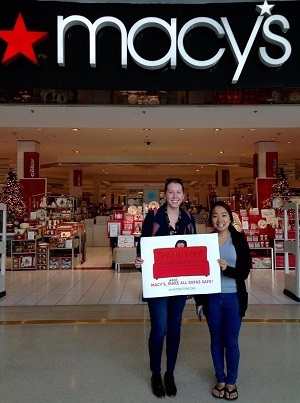 In August we joined groups from across the country to send a letter to Macy’s asking them: Will you phase out toxic flame retardants? Their response? Silence. So we turned up the heat, calling on our members and customers across the country to email Macy's about these chemicals. We’re thrilled that Macy’s listened to the thousands of emails encouraging them to address the harmful chemicals. Toxic flame retardants were pulled from children’s pajamas back in the 1970s when they were linked to cancer. Now they have also been shown to cause fertility problems, lowered IQ, and other negative health impacts; yet, they have become widely used in consumer products and furniture. These chemicals do not stay in the furniture. They migrate out of the products and collect in indoor dust where they enter people’s bodies by being inhaled, ingested, and touched. Studies show that more than 90% of American women of childbearing age have toxic flame retardants in their bodies that may increase health risks in their babies. The risk outweighs the benefits of these chemicals as flame retardants, which have not been shown effective in saving life or property in the incidence of fire. Other big retailers like IKEA, Walmart, and Ashley Furniture have already committed to phase out these toxic chemicals. Our staff and volunteers didn’t cancel their event last week, instead they headed to Macy’s to say thank you for making all sofas safe. While not all Macy’s furniture contains toxic flame retardants, we thank Macy’s for working with its suppliers to completely phase out these unnecessary dangerous chemicals.